Who is happy that Friday is here? (((raises hand))) Me me me!! It's been a busy week and I'm ready to veg out with my family this weekend and enjoy the food my husband is going to BBQ! 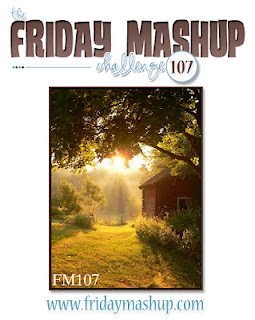 Before I do any of that though I've got my Friday Mashup card to share with you. Amanda is hosting the challenge this week and she wants us to create a project that incorporates sunshine! This can be interpreted in so many ways, so I'm really excited to see what everyone comes up with. She also wants us to make an easel card, so a really fun combination to work with this week! I decided to use a lot of yellow in my card, and blue for the color of the sky. Here in southcentral Alaska we get 20 hrs of daylight in the summer and the sky turns the prettiest blue I've ever seen. I used DSP from the Sunshine and Sprinkles pkg for the starburst technique across the top of the card, and some retired Daffodil Delight ribbon across the middle to separate it from the bottom sky portion. Hope to see you play along with us at The Friday Mashup! Create a project showcasing "Sunshine". Create an "Easel card" project. 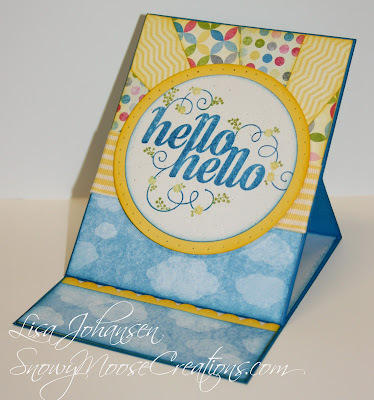 Or Mash it Up and create an "Easel Card project with some Sunshine". Purdy! I love the cloud paper you used. Great idea! Love your yellow and blue color scheme! Yellow is such a happy color. I miss those long Alaskan summer days. Have a wonderful weekend with your family. Lovely bright and happy card - fab use of the sunburst technique!